Sergeant James Ellis, 1052736, Royal Air Force Volunteer Reserve, died 3 May, 1944, age 36. He is buried at Cheniers Churchyard, France and remembered on the Hawkesbury Memorial. He was the son of Thomas and Eliza Ellis, and husband of Noreen Bessie Ellis, of Buckley. James Ellis was born 31 July 1907 at Wood Lane, Hawarden and baptized 15 August at Hawarden. In 1911 the family was living at Penymynydd with Thomas 44 a colliery shot lighter, Eliza 39, William 8, Thomas 5 and James 3. 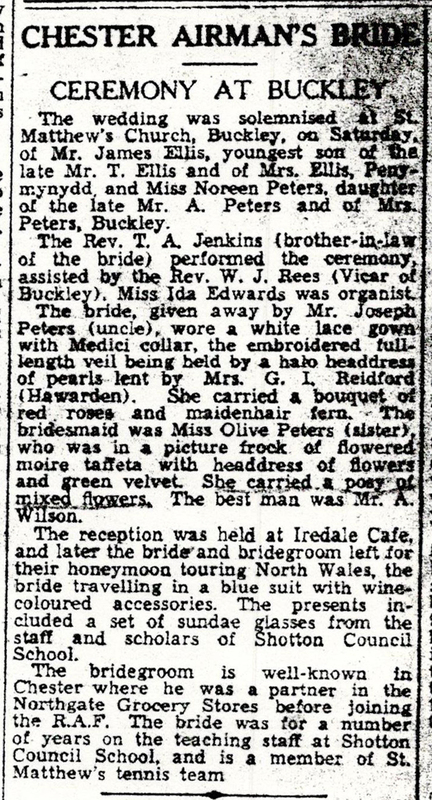 James married Noreen Bessie Peters in 1940. Noreen was a second cousin to my mother, Joan Iredale and her sister Olwen who married Arthur Wilson. Arthur was the best man for James. James Ellis was an air gunner on a Lancaster bomber from 550 Squadron based at North Killingholme, Lincolnshire. Lancaster LL826 was shot down with the loss of all aboard on a raid to a German Military Camp located near Mailly, France. This camp contained workshops and infrastructure occupied by German Panzer forces and the raid was a prelude to D-Day. The raid caused considerable damage to the weapons and equipment but due to aircraft being held over the area too long, 42 Lancasters (11.6% of the attacking force) were shot down by night fighters, with the loss of 259 airmen. The other crew members were F/Lt A.J. Grain (P), Sgt. J. Stanley (F/Eng), F/O M.R. Oliver (Nav), F/O E.C. Jones (A/B), F/O H.W. Batt (W/Op), Sgt. K.R. Dye (MU/AG0, Sgt. L. Ellis (R/AG). In addition to the crew the aircraft contained the Army Local Defence Adviser, Major S. Whipp, who had gone to see what real modern bombing attacks were like. James Ellis’s will was administered to Noreen Bessie Ellis of 7 Brook Street.